I was very enthusiastic about visiting the island of Procida, after having seen the glamorous, revered isle of Capri. My Procida travel experience started with an exciting hydrofoil trip. Hydrofoils are a special "breed" of boats that rise out of the water and literally ride above the waves. They're more outside than inside the water. 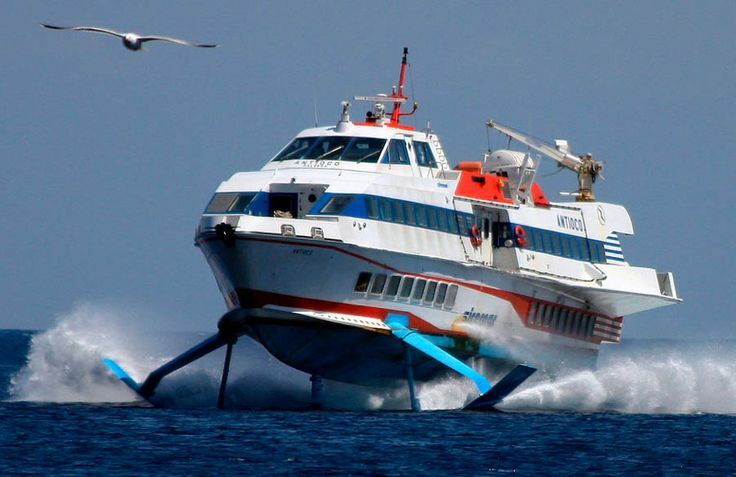 You get the picture: hydrofoils are faster. Some of them have a single hull, others have two hulls. I was anxious to board this double-dulled hydrofoil that brought me to the island. It was a bumpy ride and while from outside the boat looks great - from the distance (see the wide photo below), from up close it felt so worm, so used. Rusty here and there and just about everything felt like from the 1970's. Another interesting about hydrofoils is that some have "skids" at the bottom of their hull (these become visible as the vehicle rises out of the water). The ride aboard the boat was bumpy, as I mentioned earlier. A bit rough - logical due to the fact that the wavy surface of the sea isn't smooth. But perhaps when the waves are lower, the ride is also smoother. It's adventurous and a heck-of-a-lot more fun than by ferry. More photos and rambling about what I saw on Procida you can read here.